Two recent events hosted by Queens Memory at the Queens Library Broadway branch brought together Astoria old-timers and newcomers to talk about their memories and perspectives on the neighborhood. 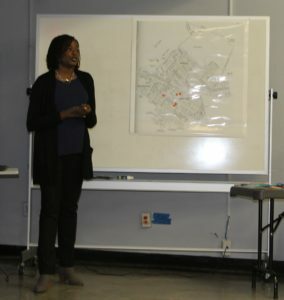 Dr. Robyn Spencer of Lehman College kicked off the first event on Saturday 12 November by setting the scene with a quick history of Astoria, which has been defined by waves of immigration. These began with settlement of the neighborhood by Dutch and Germans in the 17th Century, followed by Irish in the 19th and 20th Century, then Italians, Greeks (from mainland Greece during the 1960s, and from Cyprus after 1974), and from the 1970s onwards, immigrants from the Middle East (including Lebanon, Egypt, Syria and Yemen), as well as from Bangladesh, South and Central America, and from Europe. I then shared some thoughts from my 2011 project on this website (five years ago!) interviewing one person a week for a year who lived or worked along Astoria’s 30th Avenue. The interviews represent a wide cross-section of the street, but a few common threads appeared in many of them. These included interviewees’ passion for their work, from Peter Loupakis who runs a karate acrobatics center, to school crossing guard Julia Bravo who is considered the ‘abuelita’, or grandmother, of her local community. Another was the importance of the physical environment of the neighborhood which fosters interactions between people: with characteristics such as wide sidewalks, and the dense mixture of building uses so that you can find a hospital, a school, small stores, houses and apartment buildings interspersed along the same street. And a third, of course, is that the neighborhood is always changing. Three of the stores whose owners I interviewed in 2011 are now no longer on 30th Avenue but have moved to the parallel, quieter, 28th Avenue due to rising rent prices (Astoria Music, Bomboniera Marylu and TaxIntel). The process of gentrification and rising rents came up in the conversation at the Queens Memory event, with participants highlighting the dynamism this represents but also the challenges for many residents. That said, a group of the participants at the event, now in their sixties and seventies, were born in Astoria and have never left. 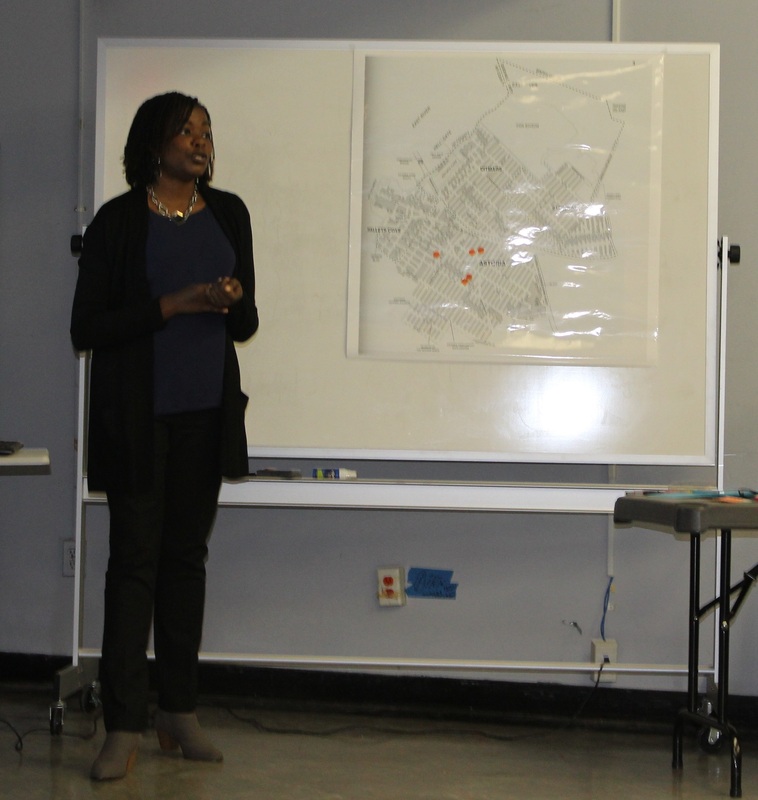 They shared with participants the passion they had felt for the neighborhood as children in the 1950s and still feel today. One recalled the fact that the local doctor used to pay house visits carrying a black bag. Another mentioned the reunions of students from Public School 6 that still bring together classmates from all over the country, so many years on. Other participants who were teenagers in the 1970s and ’80s remembered nights drinking underneath the Hell Gate Bridge, clashes between cliques divided by neighborhood “block” lines, and friends and relatives who were lost to drugs. Neighborhoods can only begin to be understood through the multiple, conflicting ways in which people see them. 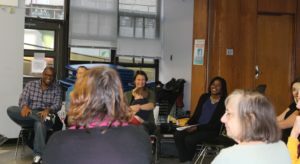 A participant recalled how she previously lived in Manhattan and couldn’t imagine herself, at that time, living in Queens. She thought that nothing happens here, just row upon row of dull low-rise houses (several years of living in Astoria later, and she’s been convinced otherwise!). My husband Carlos, who was brought up in Washington Heights, responded that he had an opposite feeling whenever he would come to Queens as a child: a positive rather than negative reaction. In his view, Queens was “the real New York”, where people were fully settled and established, unlike Manhattan which to him felt in permanent flux. The second event on 19 November had a “Music and memories” theme. It began with beautiful performances by Natalia “Saw Lady” Paruz on her musical saw, and Richard Khuzami on Middle Eastern drums. Both interspersed their playing with reflections on the role of music in Astoria. They also both described how accidents had lead them to find their respective instruments. Natalia was a dancer when she experienced a traffic accident and was told she could not dance again. It was only when she saw someone playing a musical saw in Europe some time later that she became inspired again, and her devotion to the instrument took off from there. She told the audience that on returning from that trip to Astoria, she surprised the owner of a hardware store on Broadway (no longer there) by trying out the saws on sale to see how many notes she could get from them. One of the songs that Natalia performed was written by an Israeli composer friend who visited her house in Astoria: he was inspired by the character of the old house, and wrote the song on the spot. Richard was also in an accident, which meant he no longer had movement in his ankles and had to give up his passion for playing the drum kit. 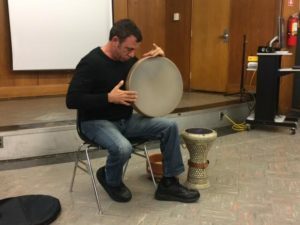 However he had grown up surrounded by Middle Eastern music and instruments – his family was originally from Lebanon – and decided to pick up playing the drums from the region which are hand-held and do not require pedals. He got rid of all his Western music and decided to listen only to Middle Eastern music to immerse himself in its rhythms and tones. This process worked – not only has he performed in multiple venues in Queens, but also at Carnegie Hall. Richard Khuzami demonstrating one of his drums. Following the two performances, a participant at the event demonstrated an antique accordion that his grandfather had brought to Astoria from Italy. He recalled how anytime his grandmother annoyed his grandfather, the grandfather would retreat to his room to play: his wife did not appreciate his accordion-playing! The participant also remembered spinning around the living room as a child while his grandfather played Tarantellas, an Italian folk dance. Richard Khuzami described the buzzing live music scene in Astoria and in the 1980s and ’90s when he would perform at places across the neighborhood through the night. Now, the live music scene is more limited, with the ascendance of electronic music. 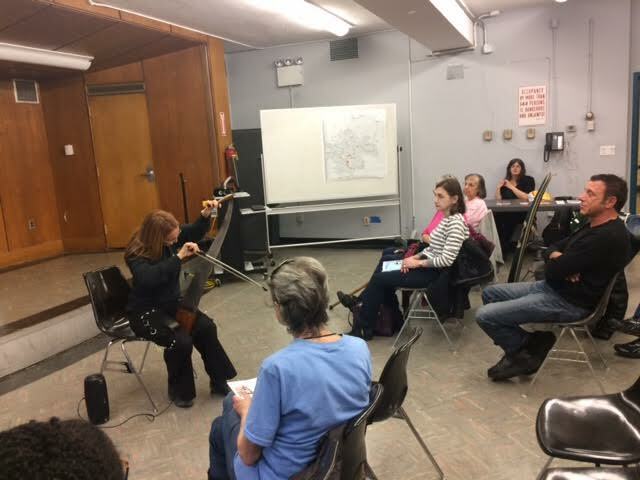 Yet towards the end of the event the discussion shifted from looking back, to looking towards the future: participants talked about ways that Astoria’s music life can be fostered by supporting young musicians and potential new venues. 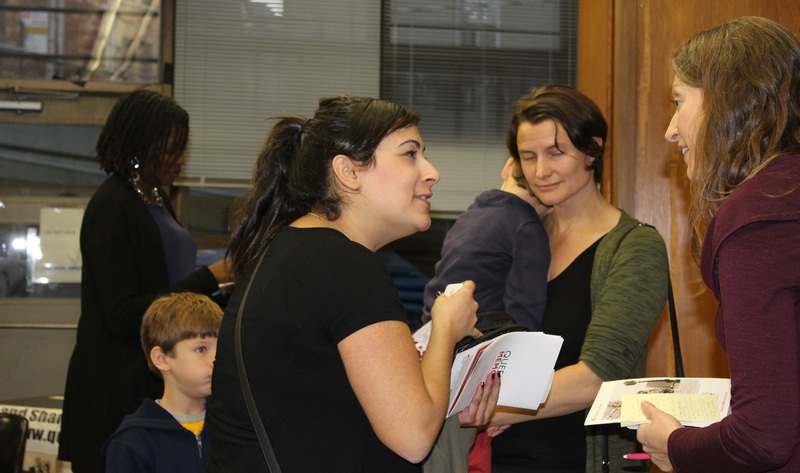 These two consecutive events celebrated the diverse communities that form Astoria, which has always been defined by close interaction between the old and the new. 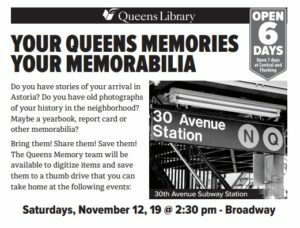 Participants also brought along their Astoria photographs and memorabilia to share with Queens Memory. 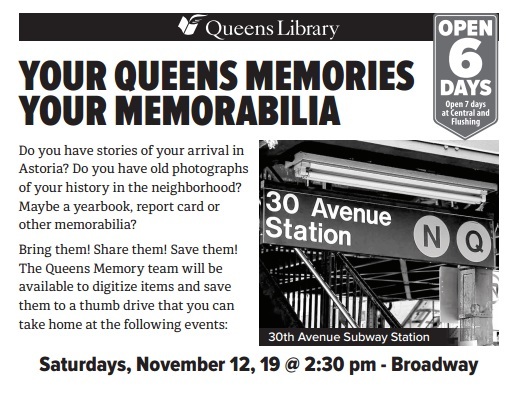 The event was organized by Queens Memory. It was part of the Queens Memory: 50 Years of Integration program, made possible with support from the National Endowment for the Humanities. Anthoula Lelekidis was one of the participants at the event: she runs the popular “Ancient Astoria” Instagram channel (featured in Queens Gazette) that preserves photographs of Astoria as it used to be. © 2019 30th Ave. All Rights Reserved.